i have made a special handmade book with my buddy at 827 ink. limited to 200 copies. this will only be for sale at my opening this saturday. Just in time for his exhibition at our FIFTY24SF Gallery, Jeremy Fish is set to release a new limited edition book, Where Hearts Get Left; a collection of 50 drawings from the show. This book release is a pictorial history of San Francisco’s stories and heroes as seen through the artist’s eyes. Published by 827INK, it is quarter bound by hand in Koskin leather and boasts a phillipine mahogany cover. This body of work and book are intended to be a love letter to San Francisco, “The City That Knows How.” With a foreword by Tommy Guerrero, each book is signed and hand numbered by the artist and is limited to 200 copies. 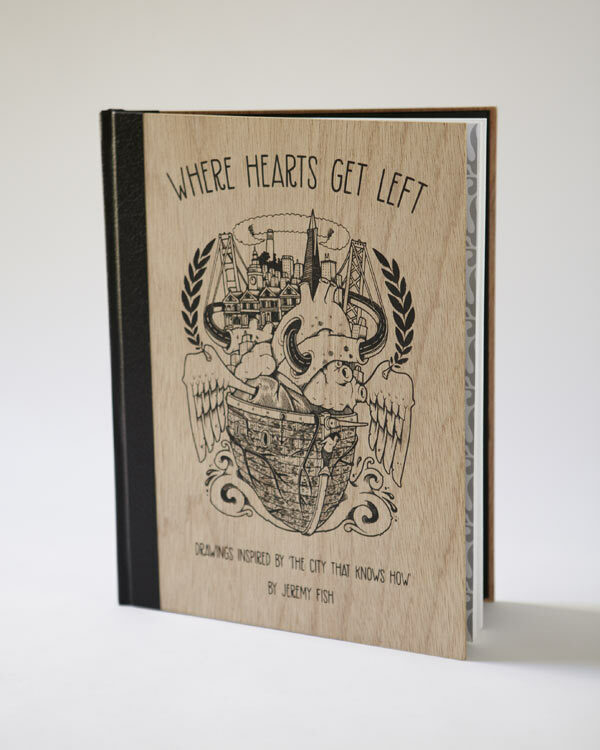 Where Hearts Get Left will first be available at the show’s opening at FIFTY24SF in San Francisco on July 14th, 2012.